With storms continuing to hit the UK, and households using their heating more, Andrew Gwynne MP is reminding people in Tameside and Stockport to install an audible carbon monoxide alarm. Carbon monoxide is produced when fuel such as gas, coal or wood doesn’t burn properly – usually because of a faulty boiler or other appliance or because ventilation has been blocked. The symptoms include headaches, nausea, dizziness and a loss of consciousness and it is often mistaken for a cold or flu. The poisonous gas has no colour, taste or smell so the only way to be fully protected is to have a carbon monoxide alarm that makes a loud noise when the gas is present. They are widely available and cost around £15. “Many people don’t realise that they’re at risk from carbon monoxide poisoning as they have their heating on more often during the cold weather. 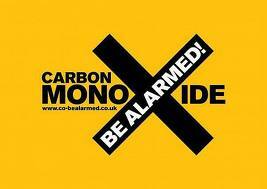 Carbon monoxide can kill without any warning, but it is very easy to prevent.